Dive into the world of fantasy and face the dragons, snakes, turtles, white tigers, phoenixes and orbs - corresponding to a certain animal species with the RTG 2018 release. It is our impression that the music and orb symbols could be a bit more original. Either way, for those of you who are not that picky, the Ancient Gods game is the right choice. You will see dragons blow fire as opposed to the water fall in the background, phoenixes rising from the ashes, very rare white tigers and dangerous snakes on turtles’ backs. Quite a deadly combination on 5 reels and 25 adjustable paylines. In the background you can even see the falling stars, so close your eyes, make a wish and start spinning the reels. Intended to present the land of Ancient Gods with the accompanying mythical creatures, the game gives you the opportunity to create a winning combination using low paying symbols which are represented by regular Orbs. Red and Green Dragons, Turtles, Phoenixes and White Tigers are considered high paying symbols. Golden Medallions unlock a fair share of free spins and also the heavenly treasures. Red and Green Dragons are intended to substitute all regular symbols. 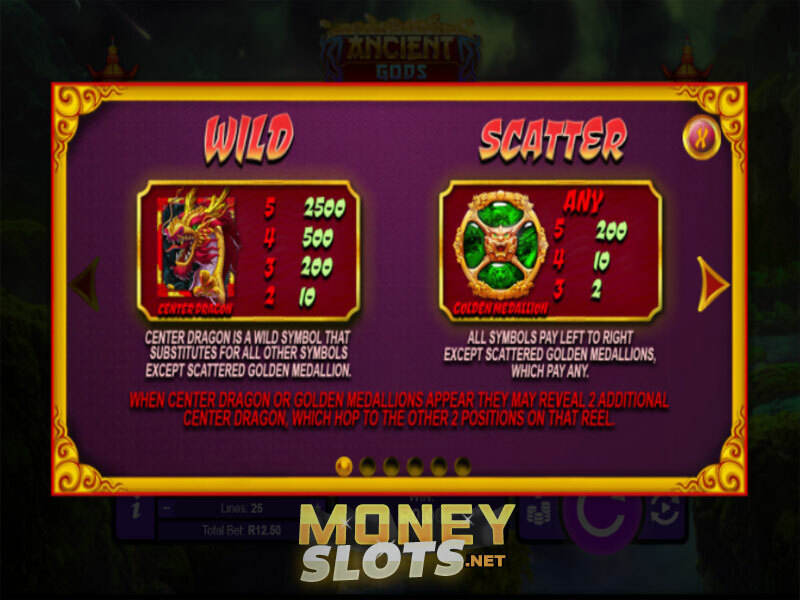 As in many of the new slot games, Wild and Scatter icons are also available and that is just an added value. This is a 5-reel, 25-payline game. The Spin button is located in the lower right corner, right next to the Autoplay and Maximum Bet options with the latter setting a $6.25 wager. In the bottom left corner, you can manually set the coin value from $0.01 to $0.25 and also adjust the number of active lines. The Center Dragon is the Wild symbol and the Golden Medallion represents Scatter which unlocks the Free Game feature. The 25 payline system pays from left to right and you’ll need at least three matching symbols on an active payline to win a payout. Three Golden Medallions anywhere on the reels will trigger the Free Games round. Also, it is desirable to collect as many Center Dragons as possible. Each Center Dragon and one Golden Medallion appearing on the reels award 2 free spins. Five Golden Medallions awards a 3x multiplier while four Scatters double the prizes.The maximum payout is 50,000x the bet per line. Realtime Gaming made sure that Ancient Gods game can be played across all mobile devices. It runs smoothly regardless of the device you use. We suggest you to take a sip from the vine cup and feel like a God for a while.